Fall is also a wonderful time to incorporate more orange veggies into your diet because of the many delicious squashes and potatoes that are in season. Below are a few examples to get the wheels in your head turning. 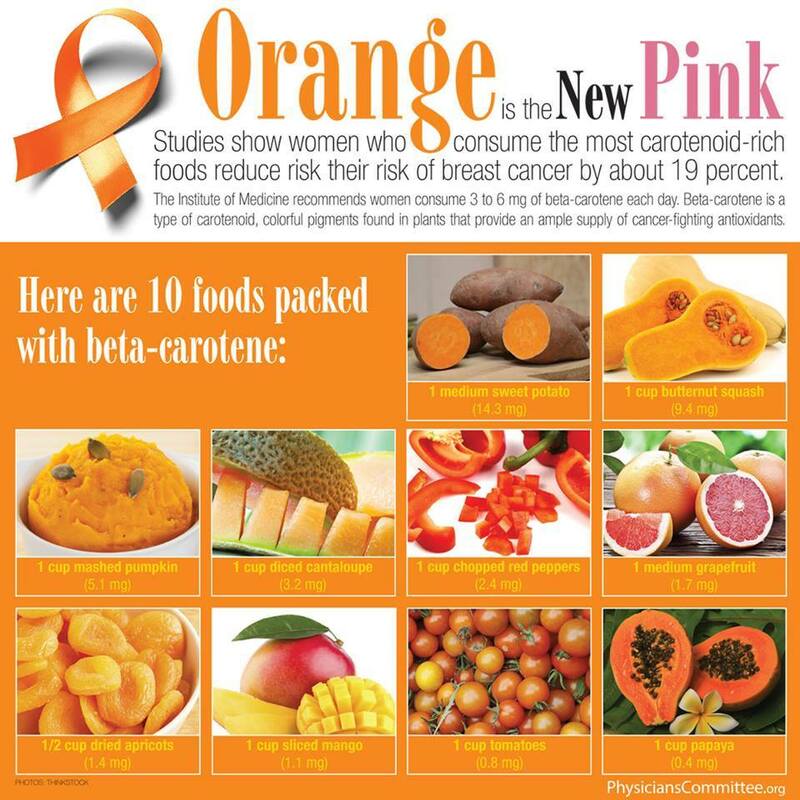 As the graphic above says consuming 3 -6 mg of beta-carotene daily is recommended. 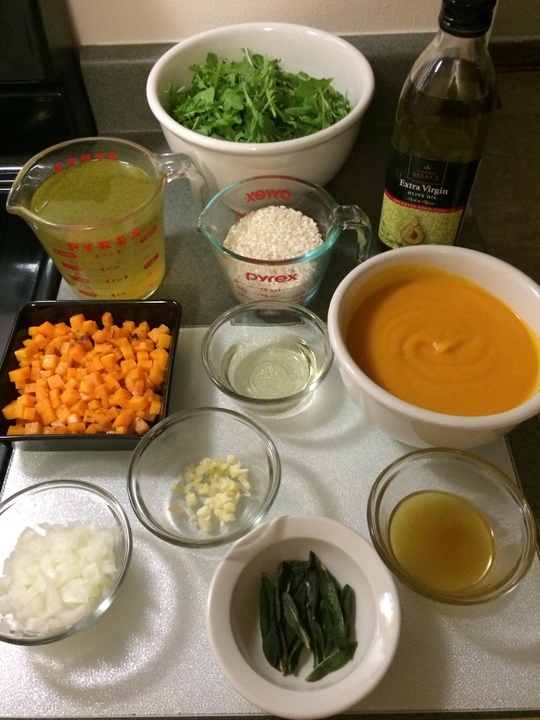 Beta- carotene has an abundance of health giving properties, including cancer fighting phytochemicals. 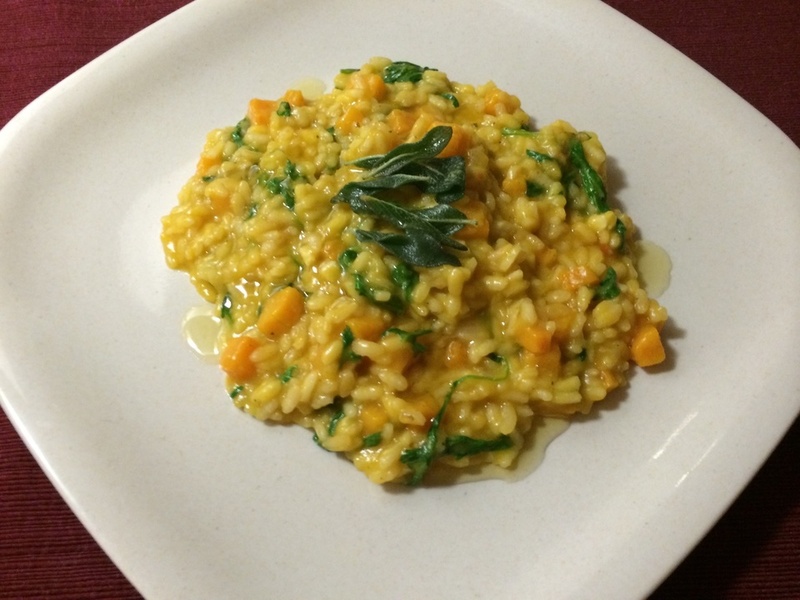 Above is a delicious and delicate Risotto I made as a task for my Plant Based Chef Certification Class, which I will discuss in future posts. It is the perfect fall dish, it had a very nice creamy consistency, nice textures, great flavor combinations and was very aromatic! This dish was somewhat labor intensive (it took me 3 hours to prepare) so I won’t give you the recipe. Something more simple may be just the ticket for you this fall! 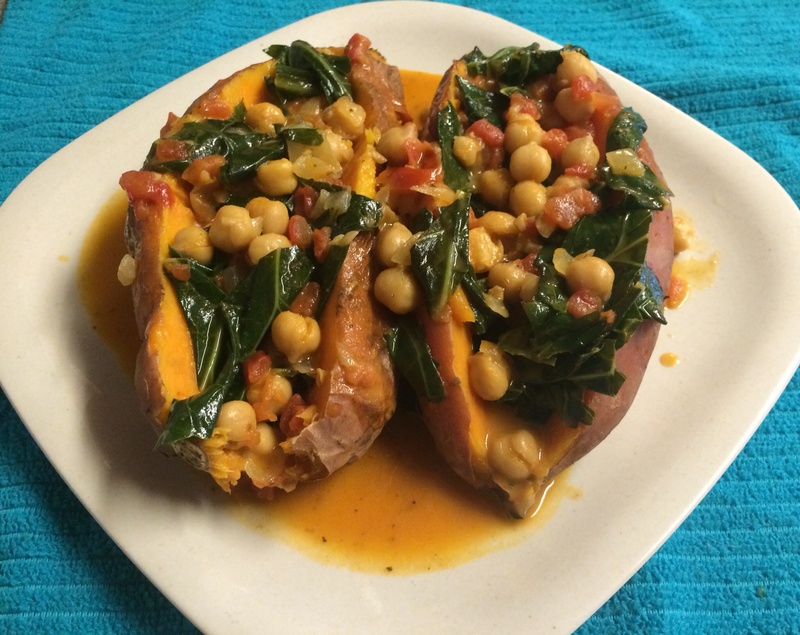 In addition, I made this dish a few weeks ago… a super yummy sweet potato dish stuffed with garbanzo beans, collard greens, tomatoes and coconut milk. This is another one of those great dishes that has just about everything you need; beans, greens, tons of veggies and is super filling. 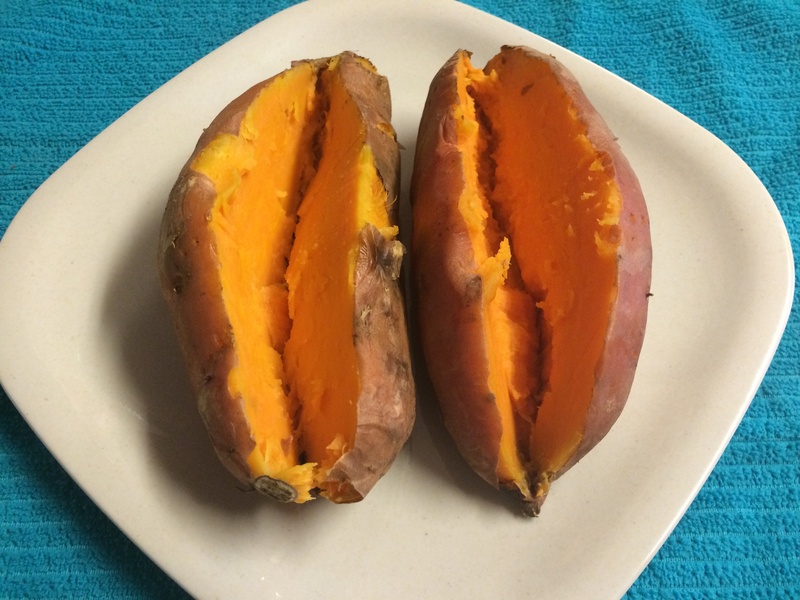 It has abundant fiber, protein, calcium and iron as well. It is pretty rich though, just a little warning, I was stuffed for several days after eating! And lastly, my fabulous co-instructor Lisa, shared this awesome, simple, super healthy dish at our most recent Denver Plant Strong Class. It is incredibly warming, healthy and comforting. By the way, it is even better the day after! 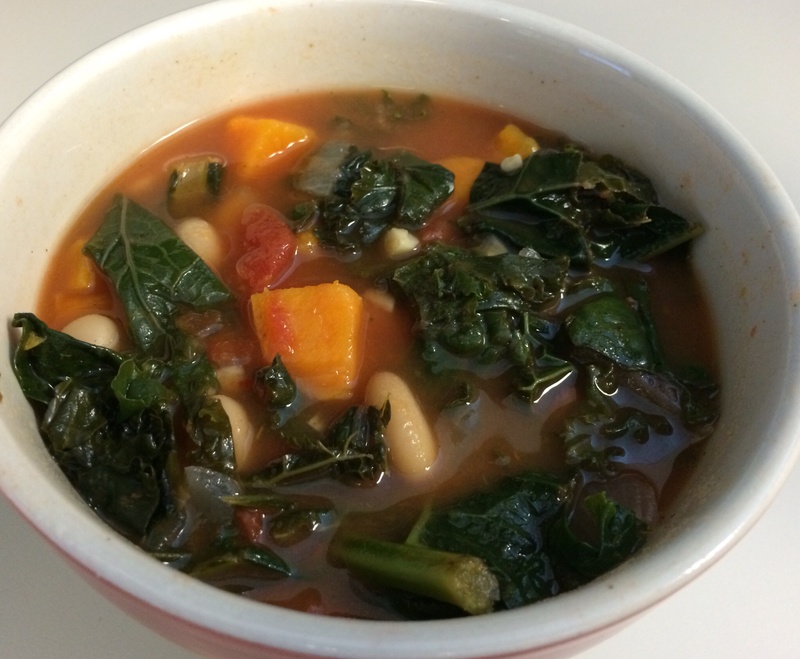 Full of healthy kale, this soup will surprise everyone when it becomes their new favorite soup. I like preparing it the night before to allow the flavors time to enhance. Place onions in large soup pot over medium heat. Stir onions frequently, adding water only as needed to keep the onions from sticking to the pan. Cook onions for 3 minutes before adding the garlic, and red pepper flakes, cook for another 7 minutes, or until the onion is tender and starting to brown. 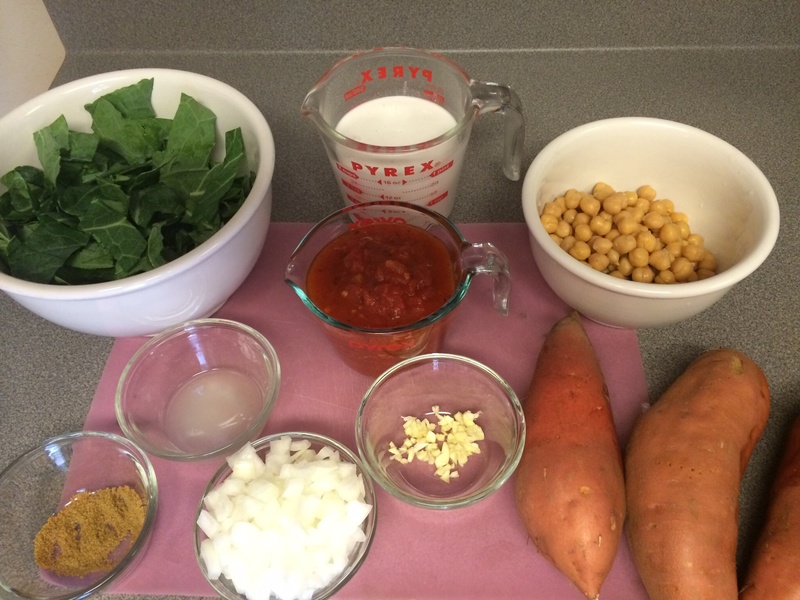 Add remaining water or broth, and sweet potatoes. Simmer for 20 minutes. Stir in Kale and beans cook another 5-10 minutes. 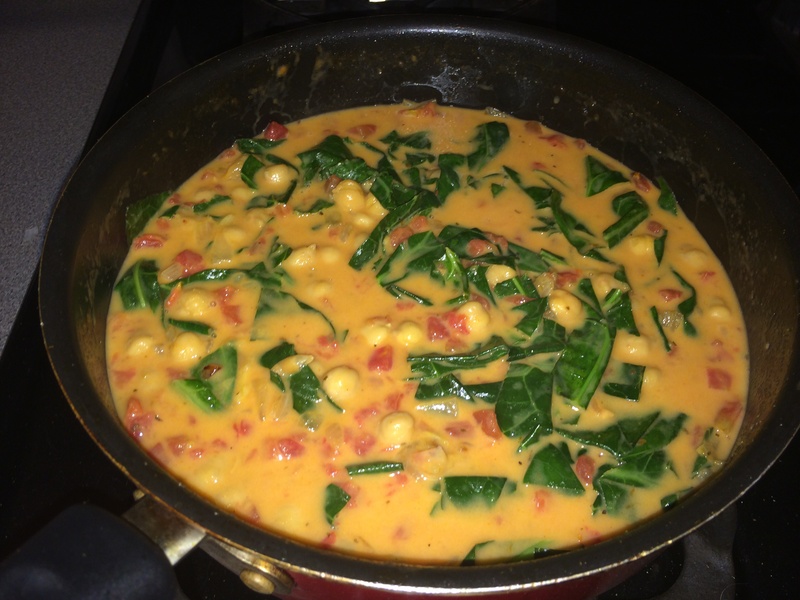 This entry was tagged breast cancer, Kale, Plant based, plant based nutrition, vegan, vegan recipes. Bookmark the permalink. ← Big news in my world!